"Right here, I'm R. Prophit, a.k.a., the Galloping Ghost." Yo, well it's a new day, full of them grits..."
fourth one slip and slid..."
Aww man, the grass done got green on the other side of the fence..."
"What is it you tryna hide off.. Them jeans so tight you know ain't nothin'.. The way workin' 'em be hurtin' 'em..
You better watch it girl, you know I got you girl..."
What was you talkin about? Yeah..."
Kept the weed blazin, don't let the drink age us..."
This for my country thug street yeagas!..." 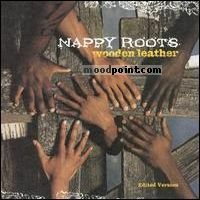 if you want to see other song lyrics from "Wooden Leather" album, click "Nappy Roots Singer" and search album songs from the artist page. If you know some new information about Work In Progress, or other song from our site, that isn’t already on song page, please let us know, Any refinement, news, or comment is appreciated. If information about Work In Progress, or any song from moodpoint directory is wrong, please contact us and write where the incorrect data should be replaced by correct data. Use "Find Lyrics" box on our site, try to use different artist or (and) song title(ex: Work In Progress) word forms.